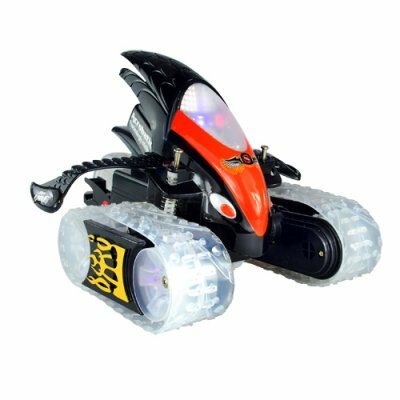 Successfully Added Radio Control Robot Stunts Toy RC Car (110V) to your Shopping Cart. Radio Control Robot Stunts Toy RC Car for sheer excitement to set your heart pounding! If non-stop fun is your idea of a good time then we're pretty sure you're going to love this great RC toy. Design-wise it looks like it was dreamed up by a mad scientist who had thought of bringing together the most intimidatingfeatures of a desert-swooping robot eagle, an earth-churning farm tractor, and a road-eating hot rod and putting all that screaming fun into one insane remote controlled vehicle. The minute you pick up the video game pad inspired remote controller, you'll notice how this stunt vehicle is different from the rest. Responsive from great distances, make this stunt car crash, spin, and twist with the dual action thumbsticks. Bash, hop, and pop wheelies by positioning the thumb sticks in different configurations. Even challenge your friends to see who can create the sickest moves! The secret to this unit's versatile movements are the left and right independent wheel drive system it employs. Each of the two thumbsticks controls one side of the vehicle. The result combined with the giant stabilizing/wheelie tire in the back is a recipe for an endless adrenaline rush. This makes a brilliant gift for yourself or your child. After you see how really great this RC Car is, then order larger quantities to re-sell. And as always, this wonderful product is offered to you at a low wholesale price direct from the leader in unique direct from China electronic products, Chinavasion. The default charger for this product is for 110V. If you need a 220V power adapter then order CVGP-T18-220V. Please check the rest of this RC Toy category for other great offers - only from Chinavasion! Fully recharge the battery before first use.